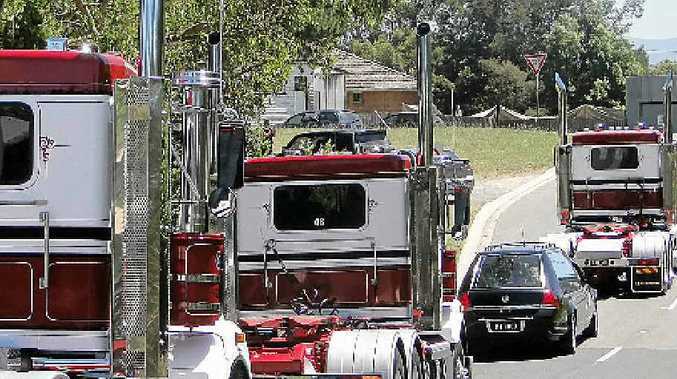 HUNDREDS of people packed the Heritage Pioneer Chapel to pay their respects to doyen of Victorian trucking Bob Wettenhall. Bob died as a result of a fall on November 30. The service, on Monday, December 10, was a celebration of Bob's 77 years. Born in Korumburra, Bob was the second son of Joe and Grace Wettenhall. Dad Joe was a character in his own right - circus man, drover, horse breaker, share farmer and an inventor. The family had many moves and Bob attended no fewer than 13 schools. His first job was in the Mitta, working for the Lands Department, as part of the rabbit eradication program. Then followed a move to Lilydale where his family was share farming. He undertook a mechanical apprenticeship with Garland's in Lilydale. Upon completion he gained employment with Mackenzie's Bus Lines at Healesville and it was around this time that he met lifelong mate Robbie Heritage. While driving buses, his brother John (better known as Moss) bought his first truck with Bob's financial assistance. Bob then drove for John and that was the beginning of his transport career. There was a short hiatus when Bob, with his father, built and installed milking machines in the western district. A couple of years later he returned to Melbourne where he got a job with Opperman's Transport. Bob went back to driving with Moss, and shortly after was invited to manage the growing business in the Notting Hill area. Bob and Moss had one too many differences and it was time for Bob to go it alone. He was approached by Tom Grayson and offered a partnership, eventually buying Tom out. Selling to the Chalmers group, he worked for that business as a director for 18 months. Then, in partnership with wife, Ann and nephew, Scott, Bob formed R.A&S Wettenhall - a very successful transport business. Bob was proud of his safe record, and although a perfectionist and of strong character, he was generous and willing to help others. Tricia. "Caring and generous, a great mentor and teacher. His leadership shaped our lives and those of many others. He led by example, never asking anyone to do a job that he wouldn't do himself." Daughter Julie said: "Dad had time for everyone. He was a pint-sized dynamo - a creator, a doer, a thinker, a giver, a mentor, a family man, a storyteller, and he was incredibly generous. He believed in 'Doing it right'. "That was his motto. He created work, he employed people, he grew businesses. He got on with the job, he solved problems. He gave generously of his time and his money." Scott Wettenhall recounted: "We had moved to Queensland when Uncle Bob came up on a visit and said to me: "You'd better get your licence and come back home. I'll put you in a truck and you can work'. "There were plenty of people who got their first break thanks to Uncle Bob. "In 2003, with Bob's financial assistance, we kicked off Wettenhall Logistics. It was there that he taught me how to run a business professionally and look after employees and value them. "We're in our 10th year now and we have 75 employees. I'd like to thank him for being that absolute mental and stable rock that I needed." The last to speak was Robbie Heritage, owner of the funeral parlour, past truckie and a good mate of Bob's for more than five decades. "Wouldn't Bobby love this. He'd be saying: 'Look at this crowd, will ya. How many have I got here?' said Mr Heritage. "It's been something like 58 years since I met Bobby at Garland's. My dad used to backload in his hearse - Bob was always impressed with hearses and trucks. "That statesman out there is a V8. He asked me how much and I told him $185,000. 'Phew!' he goes. I pointed out that we undertakers are just like truckies - chrome wheels, polished vehicles. The repayments are the same - it's just the freight that's different. "When we were building this place he'd turn up in his peaked cap, cigarette in his mouth, and he'd say: 'Let's have a cuppa. Geez, you don't drive that bobcat too well. How much did that cost?' Some days I could wish him to buggery! That's the sort of banter that Bobby and I shared over 58 years. "I had a big clean-up here this weekend - because I had to for Bob Wettenhall - and I'm looking at the air-conditioning units which I thought would cost me $42,000 but ended up being $147,000. 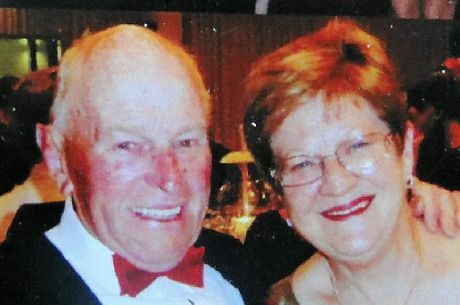 FAMILY MAN: Bob pictured with his wife Ann. Bobby said at the time: 'Geez, were they that much?' I said: 'Well you've got to chill them on a hot day.' Another time he said: 'How are you going to manage to pay for this place? Do you think you'll get enough funerals?' I told him to read the funeral notices and check me out. "Bob rings me one day and tells me that a mutual friend has died up in Griffith. 'What would it cost to get him home from there?' Probably $700 I told him. 'Geez is it? What if I come with you?' I said: 'Why, do you think that's going to save me money?' All right, be here at 12 tomorrow.' The next day away we go. It's a flying mission. We're driving along and he says: 'Why are we turning off here?' I said: 'We've got to pick up another one at Tumut.' So we get to Tumut and the doctor hadn't written out the certificate. "By this time Bob's hyper - you know what that sugar diabetes is like - I'm hanging out for a beer and he's about to fall over. "So we stay overnight and at 6.30 the next morning we load up and we're express to Griffith. "The speedos up to 120, then 145. I said: 'Listen Bob, we don't have rollovers in this caper, it's not good for our freight.' So he drops back to 120, then back up to 145. 'Geez Bob,' I said, 'you want to back off a bit. Coppers don't like undertakers either, you know'. "As quick as a flash he taps on a container in the back and says: 'Hey mate, I hope your kids haven't cancelled your licence yet - we want your points'. "Bob's brother, Moss was brilliant at specking up a truck and Bobby was brilliant at organisation. "He was a great mate to me over the greater part of my life - always ready to have a good-natured go and a good laugh. I'll miss you Bobby. "On a final note I reckon he'd be looking around here today and saying: 'Geez Spriggy, you didn't build the bloody joint big enough!' 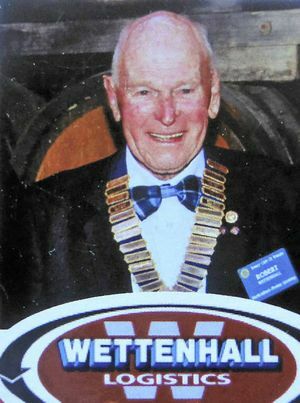 "
Bob Wettenhall - mate and mentor to many. Rest in peace.